Authentic Italian cuisine in a homely environment. 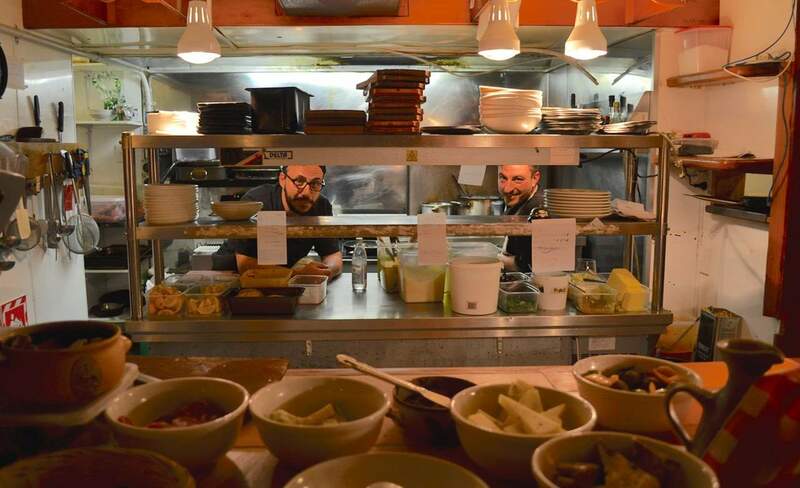 Hidden down an alleyway in Newtown, just off Riddiford Street, you’ll find Cicio Cacio Osteria – the most authentic Italian dining experience in Wellington. Chef Giulio Ricatti opened this restaurant in August 2014, with the desire to serve traditional Roman and southern Italian food, paying homage to both his roots and his heart. The unique atmosphere is apparent as soon as you walk through the door – this doesn’t feel like a Wellington restaurant. With its cosy wooden panelling, open fire and musical instruments in the corner, it’s easy to think that you’ve walked through a portal into a quaint little chalet in the Alps. There’s a warmth in the room, partly due to the intimate fit out and partly due to the genuine welcome of the staff, who treat you like guests in their own home. The menu is entirely in Italian and doesn’t have a pizza section, which immediately indicates that there is bravery and passion behind this food. The waiter kindly translates the menu for my friend and me, throwing in a little history and pointing out the dishes that use Mamma’s recipes, and we elect to share an antipasto plate ($17), followed by the porchetta ($25) and the devilled chicken ($19). This place is heaven for the carnivores. The antipasto is absolutely sublime, with mouth-watering cured meats, bread that seems fresh out of the oven and a delightful chunk of truffle pecorino. I try to avoid eating dairy, but nothing can keep me away from that cheesy epiphany. When the mains come out we continue to be enchanted by this rustic food that is at once humble and confident. The porchetta is done to perfection, with a crisp, golden crackling and succulent meat that is delightfully infused with the sweet spice of fennel seeds. The devilled chicken is also cooked to perfection and falling off the bone, with a complex blend of spices that reveals something new with each bite. Although the portions don’t look huge, a serving of roasted vegetables and mashed potato on the side leave us more than satisfied, and unable to tackle the enticing dessert menu. Next time we’ll come prepared. The service and food at Cicio Cacio are faultless, but amazingly that’s not what makes the experience so special. For me, it’s the environment they’ve managed to create that makes this place stand out from anywhere else I’ve eaten in Wellington. We ended up having conversations with diners at two of our neighbouring tables, and as we looked around the restaurant, we saw the same thing happening with other people. Beyond the authenticity of the menu and the passion of the staff, this is what makes the place feel truly Italian, and the chefs and management should be extremely proud of themselves for creating a space that is instilled with such a strong sense of family, friendship and community.